For sustainability-minded (and design-loving) Western gardeners, grey water is the hot new kid on the block. Most Western gardeners these days strive for sustainability, incorporating eco-friendly elements like low-water plantings, permeable paving, composting systems, and furniture made from recycled lumber. But there’s a new eco must-have on the block: Grey water. Quick definition: Grey water diverts water from sinks, showers, or laundry to hydrate the garden. And while, at one point in time, this may have conjured up images of hippies with buckets under their sinks, this is no longer the case. Eased permitting processing—led by the West—and the knowledge that, surprise, water is a resource we’re short on, has paved the way for grey water to come into the mainstream. 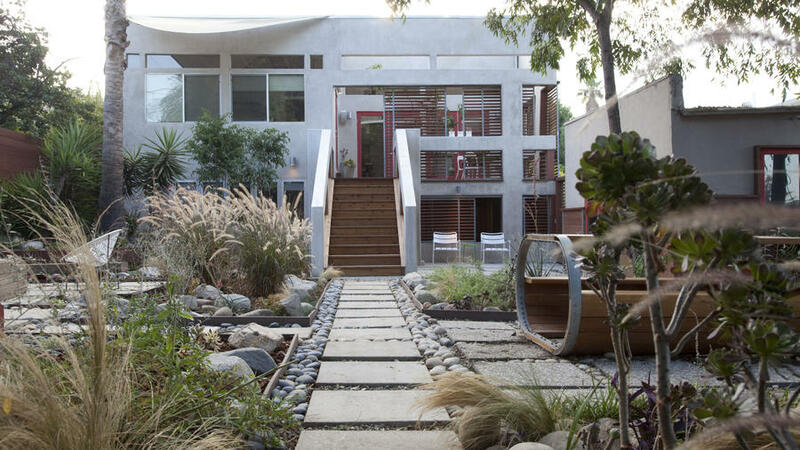 Also helping it along: Badass designers like Jeremy Levine, who incorporate greywater systems in almost every house/garden they design. That garden up above? That’s Levine’s own backyard, watered with 100% grey water. Between kitchen sink, bathroom sink, and the shower, Levine diverts 30 gallons of water each day for garden irrigation. So impressive. Oasis Design (Based in Santa Barbara, but useful links for every state!